Each year, through its Annual Conference, IIMC continues its tradition of offering an abundance of educational and information programs as well as networking opportunities to help you manage your municipality in today’s complex environment. Conference Preliminary Program Now Available! Diversity is this city’s greatest strength and strongest appeal. A grand spectrum of attitudes and cultures that are all a part of the charm and surprise that is Birmingham. Birmi ngham was born out of iron and steel. Remnants of these early beginnings are preserved in places such as Sloss Furnaces National Historic Landmark. 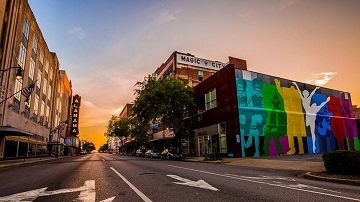 The city is also well-known for its prominent role in the Civil Rights Movement of the 1960s. A visit to the Birmingham Civil Rights Institute gives visitors an in-depth look at that important era. The area’s antique shops are becoming places of legend in upscale lifestyle magazines around the country. Trendy shopping centers have taken root all over the area, bringing tony, high-end shops to the state’s retail giant. Dozens of new art galleries surprise enthusiasts and collectors with a wide variety of paintings, sculpture, jewelry, ceramics, fine and funk art. The Conference will feature premier education programs, outstanding speakers and events. So Make Your Plans and Join Us for some Magic! Online Registration Additions (credit cards only) If you have already registered and need to add a guest, event or item please use this form.